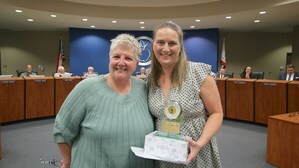 The Governing Board of the Hemet Unified School District, on nomination by Trustee Stacey Bailey, has selected Candace Ballard, teacher at Tahquitz High School, as the February recipient of the Governing Board Recognition and Award. Candace Ballard received her Bachelor’s Degree in Math from St. Mary’s College and her Master’s Degree in Educational Technology from Azusa Pacific University. Candi taught Math at West Valley High School before coming to Tahquitz High School in 2010. Candi Ballard has done a tremendous job not only leading the students in her classroom, but her department as well. Mrs. Ballard's leadership has led to significant instructional changes this past year at Tahquitz High School. Her department implemented 360 classrooms allowing all students to stand around the room working collaboratively to solve complex math problems. Additionally, Mrs. Ballard and her team have been the example for the rest of the school on effective use of collaboration time. Mrs. Ballard and her Calculus Club are everywhere; football games, basketball games, swim meets, parent nights, and club rush. If the school is open, Candi is teaching or supporting students in some manner. Her dedication to Tahquitz students and staff continues to stand out and make a difference in the lives of our students. For outstanding performance, professionalism and loyalty to the Hemet Unified School District, Trustee Stacey Bailey presented Candace with the Governing Board Recognition of Excellence Award and a $500 certificate to be used toward the District program of her choice.